2018 was the first full year of life with dramatically lower corporate tax rates, and now we’re getting early data on exactly how much less companies expect to pay. Surprising nobody — they are paying a lot less. We examined 214 firms in the S&P 500 that have already filed their annual reports for 2018. 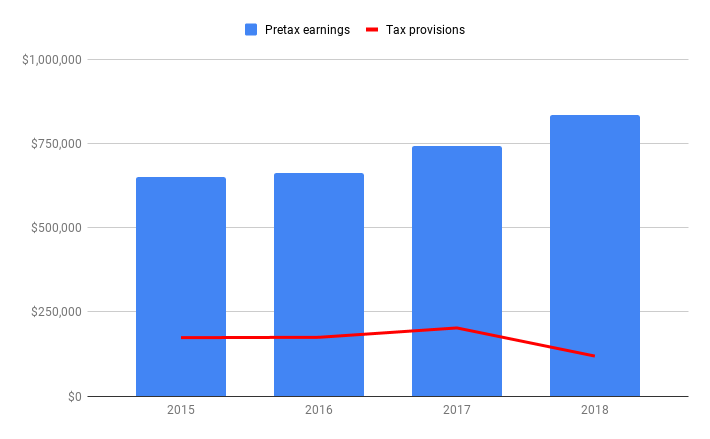 First we pulled their reported earnings before taxes and provision for income taxes; and then compared those numbers to the same line items the firms reported in the prior three years. Taken altogether, those firms saw their effective tax rates fall nearly in half, from 27.3 percent in 2017 to 14.2 percent in 2018. Their revenues rose briskly in 2018, while provisions for income taxes tumbled. See Figure 1, below. We also have a year-by-year breakdown, for those who want to delve into the data. See Table 1, below. For all you alternative history buffs: these firms had an average effective tax rate of 26.8 percent in 2015-2017, before Congress enacted its corporate tax cut at the end of 2017. If Congress had never enacted that tax cut, and we applied that same 26.8 percent rate to 2018’s pretax earnings of $832.9 billion — that would be an additional $104.4 billion in corporate tax payments. Then again, if Corporate America were paying higher taxes, its collective net income would be lower, and stock prices would likely be lower too. That’s how the data looks so far. More to come later this spring.